Incase you guys didn’t know, I’ve stared Ustreaming while drawing the strips much more then before. Be sure to check out my ustream show, and follow me at twitter, so you don’t miss it. Cause I know you want to see me draw, don’t you? This entry was posted on Friday, November 14th, 2008 at 10:51 am and is filed under Comic. You can follow any responses to this entry through the RSS 2.0 feed. Both comments and pings are currently closed. Too hilarious! Well done, Rasmus! Glad you decided that ustreaming was the way forward! It only took a little persuasion too! Hehe, yep Moo, thanks. Couldn’t have done it without you 😉 Still struggling with the drag that comes with is, however. 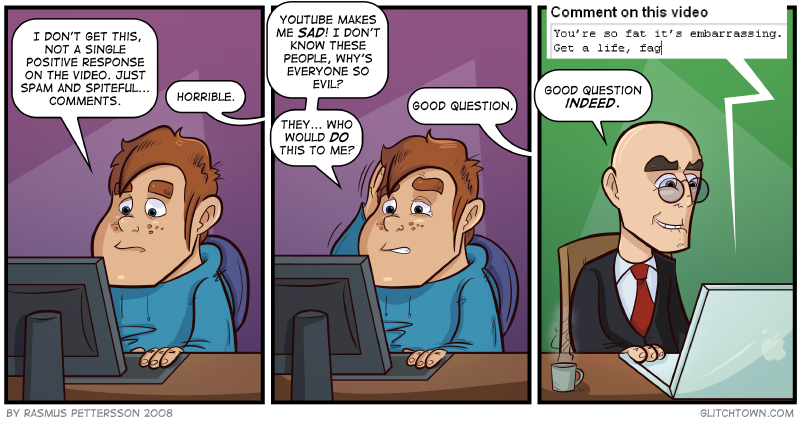 I’m unusually delighted that Isaac, the face of evil, uses a Mac to send off vile comments to YouTubers.